Unlike other smart phones that allow data to be stored in the external memory card, Apple iPhone doesn't offer such a feature, which only allows its users to store data in its internal memory. Yet, those important data on your memory card can also be deleted mistakenly or lost due to system update, device formatting, water damage, or other reasons. Fortunately, it is possible to recover data from iPhone internal memory, and here will introduce 3 methods to restore lost data from the internal memory card of iOS devices. To restore lost or deleted data from iPhone internal memory card, what you need is a professional and reliable iOS data recovery tool. Joyoshare iPhone Data Recovery is such a powerful iPhone memory recovery program. 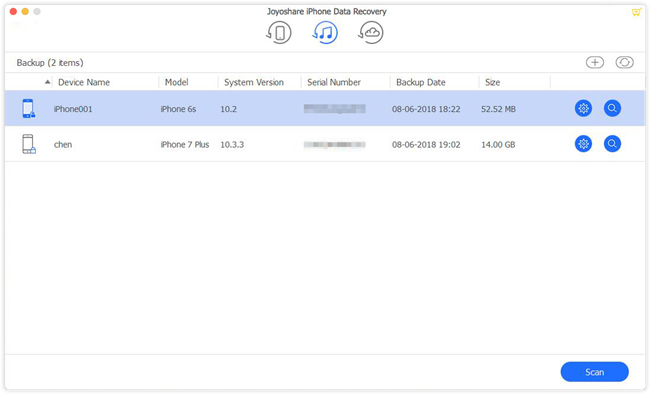 It can help you recover lost data from all iPhones, from the latest iPhone Xs, iPhone Xr, iPhone X, to the older ones like iPhone 4S, iPhone 4, etc. 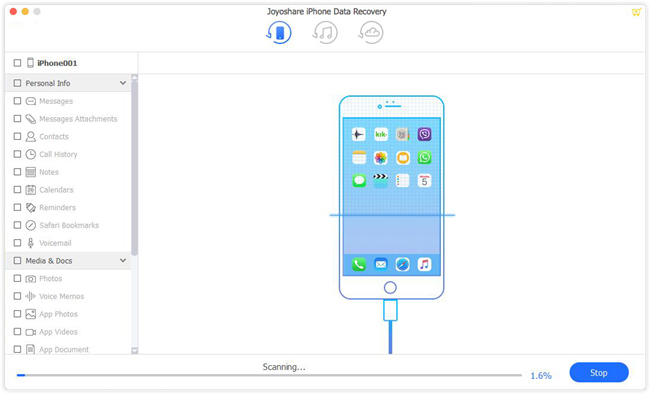 Joyoshare iPhone Data Recovery can rescue your data from various data loss scenarios, such as accidental deletion, screen broken, system crash, virus attack, upgrade failure, factory reset, water damaged iPhone, device stolen, password forgotten, etc. 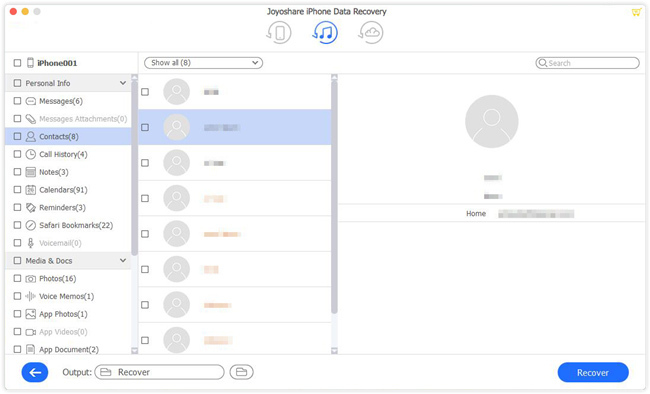 It supports to retrieve deleted iPhone contacts, messages, videos, photos, call history, notes, reminders, WhatsApp/Kik/Viber messages, voicemails, and many others from iOS device straightly or iTunes and iCloud backup files. Moreover, you're also allowed to preview and restore data selectively and flexibly. Now let's move to the detailed instruction on how to recover data from iPhone internal memory card directly. 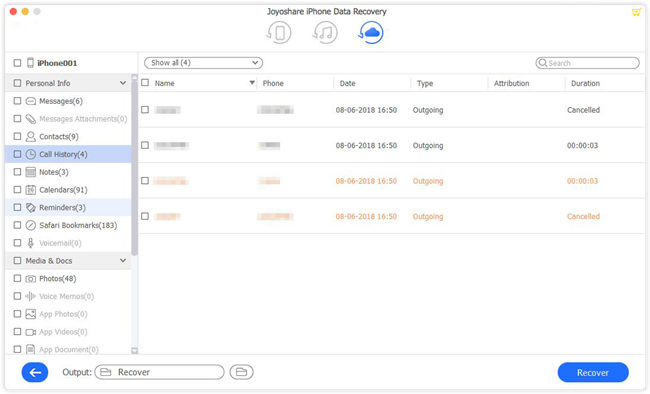 Joyoshare works well on both Windows and Mac systems, and here we'll take Joyoshare Mac iPhone Data Recovery as an example. At first, you need to connect your iPhone to the computer by using a USB cable. Launch Joyoshare app on your desktop and it will detect your device automatically. 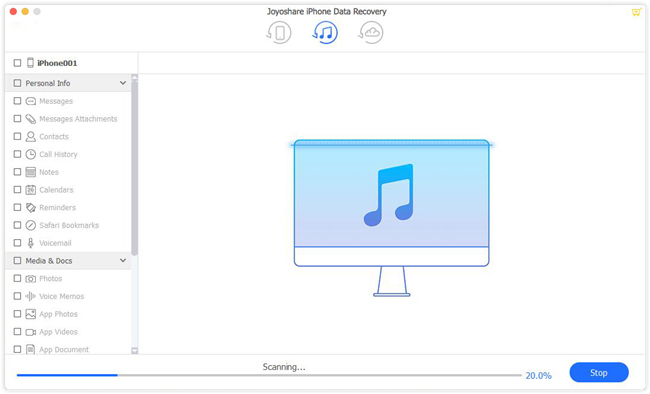 Make sure you've downloaded and installed Joyoshare iPhone Data Recovery in advance. 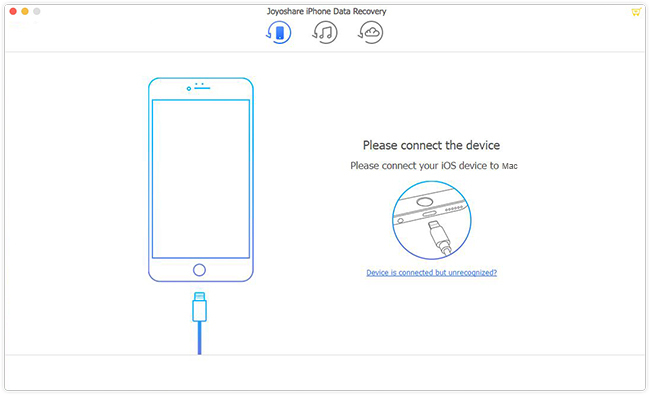 Once Joyoshare recognized your iPhone successfully, you can see the interface of "Recover from iDevice" mode. Choose the data types you want to recover such as "Contacts", "Messages", "Photos", "Calendars & Reminders", "Notes & Attachments", etc. Then click the "Scan" button to start to scan iPhone memory data. After scanning, you'll find all recoverable data be classified in categories. Preview and find the lost files you need. You can also filter out data by selecting "Only show the existing" or "Only show the deleted". Then click the "Recover" button to export and save the iPhone memory data to the local folder of your computer. Another method introduced here is to retrieve iPhone memory data from iTunes backup file as long as you have synced your data to iTunes. 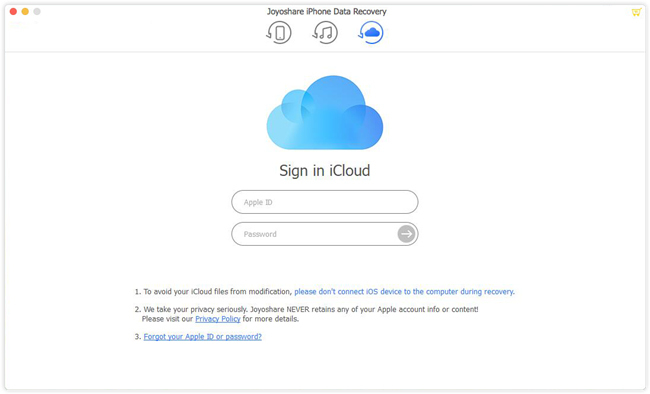 If so, you can easily get your iPhone data back with simple steps below. Open Joyoshare first and then switch to the "Recover from iTunes" mode on the top menu bar. You're now easily to see all iTunes backup files for iOS device. Pick the one for your iPhone and then hit the "gear" icon to check required data for scanning. Then press the "Scan" button to extract the content. Wait until the scanning process is completed. You can now preview all deleted or existing data, and then get the ones you desire. Click the "Recover" button to get them all exported to your computer. 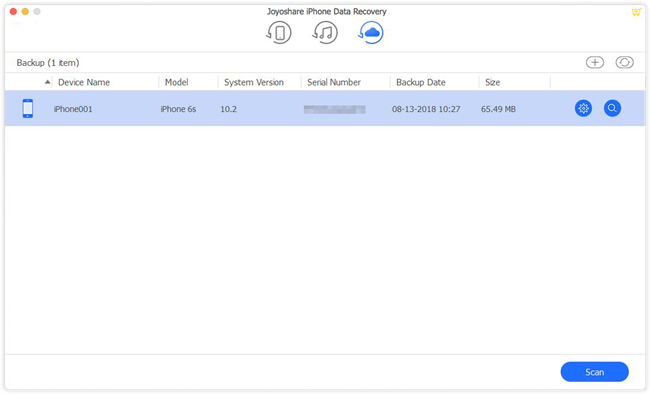 Note: Don't sync your data with iTunes once you find your iPhone internal memory data is lost or deleted, otherwise your lost data may be overwritten and cannot be recovered again. Similarly, if you have turned on "iCloud Backup" trigger on your iPhone "Settings", you're now freely to extract iPhone memory data from iCloud backup. Follow the easy guide to learn how to do it. 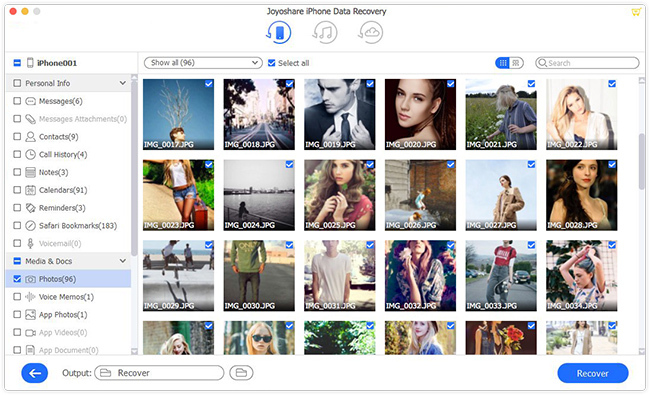 Launch Joyoshare app and then move to "Recover from iCloud" mode. Type in your Apple ID and passcode to sign in iCloud accout. Once you enter your iCloud account, all iCloud backup files will be orderly displayed. Choose the most relevant one and click the "Download" button. Then select data types you'd like to recover and hit the "Scan" button to extract iPhone internal memory data. After the scanning process is done, you can preview and select the iPhone data according to your need. And then press the "Recover" button to save them to your computer locally.